What is the GIS Site Locator Tool? The GIS Site Locator Tool is a flexible planning level tool, within the Green Plan-IT Toolkit, to aid municipal planners with strategic Green Infrastructure (GI) implementation at the watershed scale. The tool can be used to create custom maps that identify and rank potential GI locations. The tool incorporates many regional, publicly available data layers and has built in flexibility to add local data layers to best identify suitable locations and rankings of GI. The site locator tool has end-user flexibility with access to the tool’s engine resulting in an iterative tool that can be fine-tuned as additional local data, or data with better resolution, become available. What can the GIS Site Locator Tool do? The GIS Site Locator Tool allows the user to create custom outputs for their municipality and allows for multiple levels of refinement of outputs based on available local data. Local GIS data can be added to the Tool to increase the Tool’s delivery of priority GI locations. The tool can create maps of suitable locations for different GI types. The GIS Site Locator Tool allows for custom ranking of local and regional layers according to local priorities and municipal or County plans. Suitable GI locations are distinguished by both private and public designation. The tool also has flexibility to remove unsuitable areas for GI placement consideration, such as riparian or wetland areas, by adding exclusion buffers to the data layers. Who should use the Site Locator Tool? The GIS Site Locator Tool is designed for city and County planners to organize and synthesize available data for planning level efforts. The Tool outputs, in combination with other local knowledge such as flood prone areas, areas for redevelopment, educational and funding opportunities can be used to identify and plan for optimized GI placement. How does the GIS Site Locator Tool work? Iteration 9 Model Refinement 8 Site Visit 7 Public ERASE Layers buffer(ft) Building Footprints 0 Wetlands 0 Knockout Analysis 6 Tool Outputs • For each LID type: • Public and Private Ranked Locations • Combined Ranked Locations selected LID type • Google Earth Fil • es • Public and private ranked locations • Combined ranked locations • Shapefiles • Google Earth files • Summary table Private UNION Ownership Analysis SM_Public Public = 1 Query 5 Layer weight Factor weight Priority Layer LID Rank 1:nf local development 1:nl Priority Development Areas 1 1:nl Capital Improvement Projects 1 1:nl Recently retrofitted streets 0 1:nl Proximity to storm drains 1 1:nf Water Quality 1:nl Pollutant loading 1 1:nl Proximity to wetlands, streams 1 1:nl Areas of known flooding -1 1:nf Community Needs Conservation 1:nl 1 1:nl Park and open space deficits 1 1:nl Population density 1 1:nl High crime areas 1 1:nf Local Opportunities and Constraints Analysis 4 UNION 1:nl -1 Priority Habitat/biodiversity areas Connectivity / linkages INTERSECT 3 Location Type (1/0) LID 1 LID 2 LID 5 Wide Streets 0 1 1 Wide Sidewalks 0 1 1 Pedestrian Streets 1 1 1 Uncovered Parking Lots 1 0 1 Publicly owned open space Locations Analysis X LID1: BIOR X LID2: SWWT LID3: WTPD LID4: PRPV X LID5: VGSW X LID6: INFT LID Best suitability polygons (1/0) 2 Regional Base Analysis Prep work: Goals, Data, local expertise 1 Tool Structure 1. Prep Work Before running the tool, it is important to: ● Identify the goals of the planning effort ● Gather available data and determine what layers to use ● Determine weight of each data layer ● Identify local expertise required for interpreting the Tool output ● Identify the Tool modules to be included in the analysis Note: It is important to understand that the scale, accuracy and quality of the input data determines the scale, accuracy and quality of the final outputs from the tool. 2. Regional Base Analysis If The Regional Base Analysis is checked in the user interface, then a layer that identifies the most suitable locations for each LID type will intersect with all other layer, excluding possible locations outside of that area. The Base Analysis LID layers identify the most suitable areas using categorical weighted overlay of depth to groundwater, land use, liquefaction risk, hydrologic soil type, and percent slope. 3. Locations Analysis The Location analysis takes layers identified as possible locations for LID and assigns them for suitable LID types. For example it may identify side street parking as possible locations for bioretention but not for a wet pond. Other possible locations include road medians, sidewalk planters, parks, open spaces, vacant lots etc. These possible location layers also indicate if they are by nature public or privately owned locations. 4. Local Opportunities and Constraints Analysis The Local Opportunities and Constraints Analysis unions potential locations identified with a ranking layer that is developed based on the Opportunities and Constraints table which weights and ranks different layers within weighted priorities and factors, such as Water Quality, Development Plans, Installation Feasibility and Community Visibility. These factors are completely customizable and one can add or remove them based on their local priorities and information availability. 5. Ownership Analysis The Ownership Analysis applies a public or private ownership value to each possible location. This allows for separate public and private outputs to be generated from the LID Site Locator Tool. 6. Knockout Analysis The Knockout Analysis removes areas where LID is not a possible location by erasing them from the output. Possible knockout layers include wetlands, other natural habitats or water features, and building foot prints. 7. Site Visit The Outputs should then be reviewed by either visiting locations or remotely checking (eg. in Google Earth) locations that are ranked as highly ranked locations as well as low-ranked locations in order to ensure that the tool is ranking possible LID locations appropriately. 8. Model Refinement Based on review of the LID Site Locator Tool’s outputs, either via remote sensing or by site visits the user may choose to adjust their weighting or ranking or even refine their possible location layers in order to create a more refined output for the LID Site Locator Tool. 9. Iteration Through Iteration and refinement of parameters in the data tables one can refine the outputs to create a useful planning level map to help identify and prioritize different possible locations for Low Impact Development. Note: It is important to understand that the scale, accuracy and quality of the input data determines the scale, accuracy and quality of the final outputs from the tool. If The Regional Base Analysis is checked in the user interface, then a layer that identifies the most suitable locations for each LID type will intersect with all other layer, excluding possible locations outside of that area. The Base Analysis LID layers identify the most suitable areas using categorical weighted overlay of depth to groundwater, land use, liquefaction risk, hydrologic soil type, and percent slope. The Location analysis takes layers identified as possible locations for LID and assigns them for suitable LID types. For example it may identify side street parking as possible locations for bioretention but not for a wet pond. Other possible locations include road medians, sidewalk planters, parks, open spaces, vacant lots etc. These possible location layers also indicate if they are by nature public or privately owned locations. The Local Opportunities and Constraints Analysis unions potential locations identified with a ranking layer that is developed based on the Opportunities and Constraints table which weights and ranks different layers within weighted priorities and factors, such as Water Quality, Development Plans, Installation Feasibility and Community Visibility. These factors are completely customizable and one can add or remove them based on their local priorities and information availability. The Ownership Analysis applies a public or private ownership value to each possible location. This allows for separate public and private outputs to be generated from the LID Site Locator Tool. The Knockout Analysis removes areas where LID is not a possible location by erasing them from the output. Possible knockout layers include wetlands, other natural habitats or water features, and building foot prints. The Outputs should then be reviewed by either visiting locations or remotely checking (ex. View in google earth) locations that are ranked as highly ranked locations as well as low ranked locations in order to ensure that the tool is ranking possible LID locations appropriately. 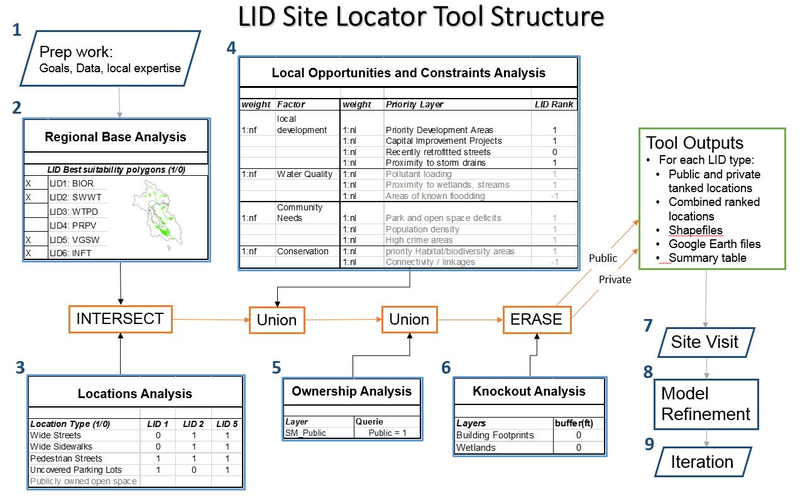 Based on review of the LID Site Locator Tool’s outputs, either via remote sensing or by site visits the user may choose to adjust their weighting or ranking or even refine their possible location layers in order to create a more refined output for the LID Site Locator Tool. Through Iteration and refinement of parameters in the data tables one can refine the outputs to create a useful planning level map to help identify and prioritize different possible locations for Low Impact Development.